Fracking Regulations In States Leave Wells Without Inspection, Environmental Group Says | "Global Possibilities"
Hundreds of thousands of active oil and gas wells go without government inspection in any given year, and fines for regulatory violations are too small to change drilling company behavior, according to an energy watchdog group’s review of regulation and enforcement activities in six states. The 124-page report, released Tuesday by the Oil & Gas Accountability Project at Earthworks, an environmental and public health advocacy group based in Washington, examined well inspection data, violations, enforcement actions and penalties in Colorado, New Mexico, New York, Ohio, Pennsylvania and Texas. The analysis suggested that state regulators are often understaffed, underfunded, or otherwise unable to keep pace with rapidly expanding oil and gas exploration and the attending risk of spills, leaks, contamination and accidents that might arise through negligence or deliberate shortcutting. The review lands amid a contentious presidential election that has been animated in part by starkly different views on energy development and the appropriate role of the federal government in ensuring that public health and the environment are protected from industrial activity. Oil and gas industry representatives, as well as state regulators, quickly dismissed the report as both flawed and biased. Among other things, the new analysis, which took two years to complete and was partially funded with a grant from the Heinz Endowments, a philanthropy based in southwestern Pennsylvania, found that only a fraction of active wells in any of the six states examined are actually inspected by state regulators to ensure that they comply with state rules and regulations. 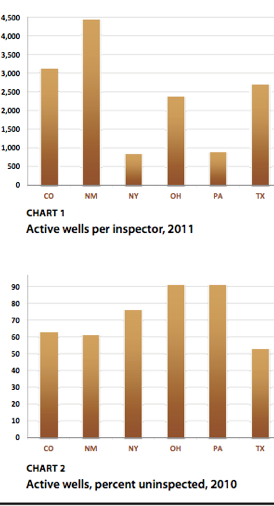 Texas had the best record on that front, with 47 percent of active wells receiving some inspection in 2010. In Pennsylvania, which has seen an unprecedented boom in natural gas drilling over the last decade, only 9 percent of active wells — or only about 8,000 of the state’s roughly 90,000 active wells — were inspected. In some states, requirements for frequency of inspection are non-existent, the analysis showed. In others, recommended guidelines have been developed, but often go unmet. Pennsylvania’s guidelines, for example, call for at least five inspections of each well during the drilling and preparation stages — the period when most problems typically occur — and at least one inspection per year after completed wells begin producing, according to the Earthworks analysis. In an email message, Katherine Gresh, a spokeswoman for the Pennsylvania Department of Environmental Protection, argued that the Earthworks report created a skewed picture by conflating data on tens of thousands of older and safely operating conventional wells, and newer sites that are plumbed using horizontal, hydraulic fracturing. The Earthworks analysis also argued that while penalties have been increasing in many states, the sums pale in comparison with profit being reaped by drilling companies. The total amount of fines collected from 2009 to 2011 ranged from a high of $4 million (collected in Pennsylvania in 2010) to a low of $14,000 (collected the same year in New Mexico), according to the analysis. By comparison, the market value of a single gas well in Pennsylvania, the report found, was estimated to be about $2.9 million, suggesting that companies are able to simply absorb penalties as a cost of doing business, rather than alter behavior. “In preparing to do this research, we did an initial round of discussions with former regulators and ex-industry inspectors,” Baizel said. “They pretty much cut to the chase and said money matters. They told us you’ll only get the industry’s attention if you hurt their pocketbook, and that anything less is really just the cost of doing business to them. Oversight of energy development has become a central issue in the 2012 presidential campaign, with the administration of President Barack Obama coming under withering attack from Republican challenger Mitt Romney for what he describes as stifling and onerous regulation of oil and gas producers. Fossil fuel producers have also redoubled advertising and lobbying efforts to unseat Obama in November. In an energy policy white paper released last month, Romney argued that “President Obama has intentionally sought to shut down oil, gas, and coal production in pursuit of his own alternative energy agenda,” and that “states have crafted highly efficient and effective permitting and regulatory programs that address state- specific needs. Baizel said the review of state policies suggests that is not the case. “Romney needs to read the data in this report, because it doesn’t support what he’s suggesting,” Baizel said. “The states are not able to enforce the rules as they are, so piling more on their plate is not going to get a better result.” Baizel added that proper oversight needs increased cooperation among local, state and federal agencies. In response to an email query, an aide with the Romney campaign noted that under the candidate’s proposed plan to shift more regulatory responsibility to the states, federal agencies would “certify state processes as adequate” before control is transferred. Carlton Carroll, a spokesman for the American Petroleum Institute, the largest national trade group representing oil and gas companies, said the industry was already among the most heavily regulated in the country — both at the state and federal levels. Still, the Earthworks report, titled “Breaking All the Rules,” suggested that in many states, regulators are pressured to by industry representatives to rush permitting at the expense of careful oversight. “During oil and gas booms, state agencies typically come under pressure from the oil and gas industry (as well as some elected officials) to expedite permits for drilling and other oil and gas development processes,” the report noted. “By reducing the time spent on reviewing permits, agencies are less likely to consider site-specific permit conditions, which could ultimately impede enforcement actions.